A tamed lynx living in an improvised enclosure on a balcony in suburban Moscow has been scaring off neighbors with early morning howls and fueling anew a long-standing debate on whether exotic pets should be kept in captivity at all. The feline has been kept in a tiny enclosure on the balcony in a flat in northern Moscow and fed on chunks of raw meat, up to 1.5 kilos (3.3lbs) a day. Despite being a wild cat, Lynx is housebroken and is even trained to use a baby’s bathtub as a toilet. Speaking to RT, Aleksandr explained that, oddly enough, the idea to tame the lynx came to him while he was boar hunting. One of the men who Aleksandr was hunting with that day accidentally shot a lynx, which made the now proud owner of one to feel sympathy towards the deceased feline. “I took a look at the dead animal and felt bad about it. I got interested in the animal, so I went to the local fur farm and found out more about these creatures, how they live and I bought one for myself,” he told RT. 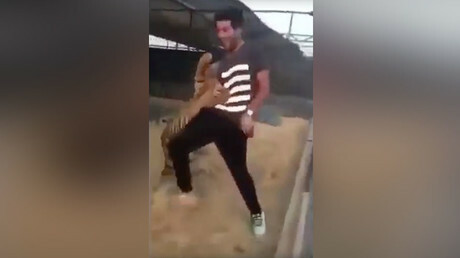 However, not all view his actions as an act of goodwill, with animal rights advocates arguing that apart from endangering themselves, exotic animals’ keepers also force the creatures, which are supposed to live free in the natural habitat, to suffer in captivity. “Keeping exotic animals as pets is completely nonsensical, even if people are well-intentioned, it’s just impossible to do so in that sort of environment,” Samul Badiani-Hamment, campaigns assistant at PETA, told RT, referring to Lyubarsky’s case and hundreds of similar cases all over the world. “We might rip them away from their natural habitat, we might force them to live a life of misery and in captivity, but they will always retain their natural instincts, they will always be frustrated with a life in a tiny space compared to what they are used to,” Badiani-Hamment added, arguing that it’s inevitable that wild pets will eventually get “miserable, stressed and they will lash out” at people. In the UK, for example, keeping exotic animals is, if not commonplace, but certainly not a rarity. In May 2016, an investigation by the Press Association revealed that thousands of dangerous wild animals are kept in UK apartments, with over 100 councils having issued special Dangerous Wild Animals (DWA) licenses to owners of predators. Among the exotic animals kept across the UK, are at least 13 tigers, over 300 cobras, two lions, 10 alligators, nine crocodiles and even 15 wolves. 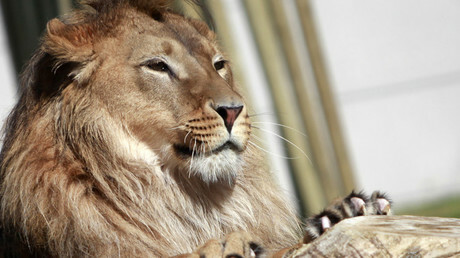 In Russia, however, there is no specific regulation in place to govern the treatment of exotic animals, with the same rules applying to them as to regular pets. Lyubarsky said he doesn’t see a problem with a lynx residing in his apartment, as it had been properly vaccinated and has an animal passport issued for it. On the other hand, Iain Newby, an exotic animal keeper from the UK and a longtime head of the Dangerous Animals Rescue Facility, said there was nothing wrong in general with keeping a lynx at home, although perhaps not in this specific case. “For if I was going to keep a lynx, it would have a large outside enclosure and it would have all its needs met and cared for. There is no reason why they can’t become tamed, like that one is,” he said. He believes that the negligence on behalf of the unlicensed pet owners should be of a particular concern. Aside of the debate, it is noteworthy to mention that if a wild animal – especially such as a lion – does attack, there is “little chance to save the person,” Bair Sambatov, a pediatric surgeon and orthopedic traumatologist, told RT.